View topic - RgbQuant-SMS - reduce the tile count of your images - Forums - SMS Power! This is an experiment I'm making for converting an image to a SMS-compatible palette+tileset+map while keeping the number of tiles down to a predefined limit; it uses RgbQuant.js to reduce the number of colors, then it does the usual steps of dividing the image into tiles and removing the duplicates; finally, it uses clusterfck's k-means implementation to group tiles by similarity, and uses that information for merging together tiles that are similar enough. 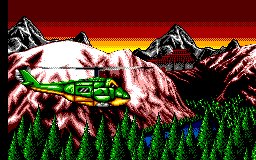 Strange that the snes sms3 image a gradient is created to deal with the backdrop color change yet on the actual gradient images it sticks to solid colors. Is this about the configurations? That seems to be because the gradient has lots of unique colors all over the spectrum, leading to limited options for color reduction, while the SMB3 image is mostly composed of repeating colors. Could you add ordered dithers? It seems to often merge a solid tile with one with a single pixel set, and choose the latter. Can you make it prefer the solid one in this scenario? Possibly linked to the above, does it give weight to tiles which are used more often? Ordered dithers could be a good idea, specially since it would lead to a smaller amount of not-quite-identical tiles, hopefully increasing the quality of the end result. The original RgbQuant.js didn't come with any ordered dithers, but I guess that functionality could be added without much trouble. Currently, the tile merging is averaging together the tiles from a cluster and then passing the averaged tiles again through the color reduction; I imagine there are multiple experiments that could be done in order to implement this part, maybe there could be the possibility of doing a weighted averaging by tile popularity, or maybe just pick the most popular tile from each cluster instead of using the average. Another idea would be to use image entropy in order to estimate which tiles are more 'interesting', in order to weight the averages, or even to leave a few of the most interesting tiles untouched..
New update: Now the merging of similar tiles is weighted by popularity; this improves visuals in large areas of solid color, but the more unique tiles suffer from a quality loss. Maybe I should turn that into a parameter. - Implemented a few more user-adjustable parameters to the demo application, allowing to change how many tiles will be used, and how the merging will be weighted. - One idea would be to allow using 2 palettes (possibly with different number of colours). The algorithm would somehow figure out which palette is best used by which character. Another idea would be to be able to lock colors into a palette. That is if one want to share palette with sprites. Instead of just reducnig the color count, the availability of unmutable colors can be taken advantage of. Got beautiful result with 500 tiles and nice dithering with the demo. B: Run a clusterization on the tileset to separate the tiles into two clusters, and then generate one palette for each. I guess I'd have to experiment to see if those would work. I guess that could be implemented by prepopulating the color histogram with artificially high color counts for the fixed colors. I guess the demo is already working well enough that it would viable to add support for uploading custom images... I think I'll do that next, before proceeding with more experiments. A new version is available: now, you can provide your own images. That's weird... did you try pressing F5? Which browser are you using? Okay, I'll try testing it on Chrome this afternoon. Chrome 39.0.2171.99 m: Works okay. IE 10.0.9200.17183: Complains that Math.log2 does not exist. I may try testing that on a Windows 7 and a Ubuntu machine when I get back home, to see if it can be reproduced on those. Did anyone else have problems running it on a Mac? Thank you for your work. Work perfectly with Firefox Win7. I've also tested it on Firefox 20.0 on Ubuntu 13.04: it complains about missing Math.log2. New update: now you can use ordered dithering. Hi Haroldoop and all ! I written a tool for PC-Engine to convert RGB images to pc-engine format. I built my clustering palette family and pick up some algorithms for dithering. PC-Engine is a 16 + 15*15 palettes (color 0 is the same for all palettes) from 512 colors. So I'm very interesting by your work ! it's still a beta, I must add some functions and improve the render. This PC-Engine tool looks amazing! I specially like the fact that it can handle multiple palettes. And the idea of letting the user choose which parts of the image will be dithered and which won't also sound interesting. I was also thinking on doing something similar for RgbQuant-SMS, except it would let the user choose which tiles should be kept unmodified during the tile merging process. A tool to convert an image for SMS 16+16 colors would be very nice! Yes it's can be modify this tool easily for others architectures. I should improve palettes functions (let the user to choose it or load static palette). In some cases you can see bad effect color with tiles. It's because my cluster function doesn't take tiles neighbors information color. I have an idea to fix it. it's should be useful to add a little editor to correct manually the final image. In all cases, I'm not limited about PC-Engine. I'm working on few tools for a lot of architectures. If you have some questions send me an email. New update: Now you can have multiple palettes per image. This is really nice and useful, thanks! I have one question though: when reducing tiles, the algorithm seems to be relatively indeterministic (as in, when running it twice with the same image and the same set of parameters you get different results). Is there a way to configure it that you get the same result each time? Reason I ask is 'cause I'm investigating the possibility of using this to implement lossy compression for FMV/animations. Here, re-use of tiles between frames would be greatly helped if the reduction algorithm behave deterministically for the same image (and preferably for very similar images as well, but that's not your problem :) ). I guess the indeterministic results are because of the tile clusterization step; I'm not seeding the k-means algorithm with predefined centroids and, as a result, it's seeding itself with random ones; seeding the clusterizer with non-random data should be enough to create repeatable results. I haven't implemented that feature yet, but it should be easy to implement. Sounds like a very interesting idea. One easy way to use this tool to optimize a video would be to treat all the frames as a single giant image, though the optimization in this case would consume quite a lot of memory; one less expensive alternative would be to process a limited number of frames at a time, just like many video codecs make use of keyframes. Yet another alternative would be to reduce the tile count of each frame individually in order to ensure none of them individually crosses the maximum tile count per frame, and them merge together the tilesets of all the reduced frames, so as to ensure the video uses as few tiles as possible. Okay, now I've just modified the clusterization to be non-random. Sounds like a very interesting idea. One easy way to use this tool to optimize a video would be to treat all the frames as a single giant image, though the optimization in this case would consume quite a lot of memory; one less expensive alternative would be to process a limited number of frames at a time, just like many video codecs make use of keyframes. That's exactly what I had planned on doing: put a bunch of frames together in a single image (with solid 8-pixel borders between them) and have them all work from the same set of tiles; and repeat that for the entire clip. I'm doing a Bad Apple port (although not for the SMS but the TI-99/4A, which only supports the legacy SMS modes), so my source material really helps in achieving good compression results with a simple decompression algorithm on the target. It should be a simple enough fix. I'll get into it as soon as I arrive home. Okay, it's corrected. Now, it should work okay both with and without dithering. It seems to be a bit inconsistent. I was using an image which was already made for SMS, just with too high tile count, and it was doing some weird substitutions in places where the tile is an exact mirror of one elsewhere. In other places it is clearly using mirrored tiles. Image is attached. I was reducing to 387 tiles with no dithering. The top-left dithered tile gets swapped for a blank one instead of a mirror of the tiles to its right. It also reports 444 tiles before optimisation - there are 442 after mirroring optimisation, but maybe it's not trying to do that at this stage. Thanks for the example; I have tested the image with default options, with 256 tiles (the default), 444 tiles (the amount of tiles in the image after removing duplicated/flipped images) and 128 tiles; please see results below. I have also tested it with a minimal, perfectly simmetrical, 16x16 image; it seems the program is actually failing to detect some edge cases. The tilecount should have been reduced to 1 right on the first step, but it isn't, and it is also failing to flip the tile correctly at the last step. I think the minimal case is demonstrating it better than my example. Anyway, that one bug is now out of the way. Please, try accessing the RgbQuant-SMS.js page, and pressing Ctrl+F5 to refresh the browser cache. The tool should be working much better now. one small thing still: number of "Tiles w/o similars" is set at maxTiles even when number of "Tileset w/o dups" is lower.